So you want to become a pilot. Like myself, most of you probably want to become a professional pilot. Or maybe you just want to fly for fun. Whatever your story is, the road to becoming a pilot of any kind is long and winding, yet exciting and unforgettable. You will be challenged like never before, and your motivation will be put to the test. Despite this, I can guarantee you will have an amazing time throughout your training process. You will see things you’ve never seen before, try things you’ve never tried before, and feel things you’ve never felt before. I can say that my flight training journey has been an utterly unforgettable experience so far, and as I wrap up my commercial single-engine training and transition into multi-engine, I am more than excited to see what the next chapter of my story will include. well with both on the ground and in the airplane. Ideally, your personalities should mix well and you should feel comfortable with your instructor’s teaching methods. A good instructor is a person who doesn’t intimidate you or make you feel stupid. If you are assigned to an instructor who clashes with your personality or your learning style, your training process will be slower and less enjoyable. If you don’t enjoy spending time with your instructor for any reason, don’t be afraid to switch to another instructor who will work better with you! You will find that working with the right instructor will make your training so much more productive and exciting. If you don’t completely understand something for whatever reason, make sure you let your instructor know! He/she will gladly re-explain the topic to help you fully understand. Perhaps just as important as finding the right instructor is making sure you study outside of your one-on-one ground lessons with your instructor. It may seem like a lot of work, but studying on your own will make training easier and faster. Simply taking notes while your instructor teaches a new topic just won’t “fly”. You must go home and review those notes you took, or get together with some friends and have a group study session in order to make that brand new information really stick. In addition, at the end of a lesson most instructors will give a preview into what you’ll be learning about next time. Use the time in between lessons to study up on the next topic. That way, once you meet with your instructor again, you’ll impress him/her with your newfound knowledge (not to mention it will make his/her job easier!) Studying outside of lessons will also decrease the money you spend for your training. The more you study, the less time you’ll have to listen to your instructor re-teach things you’ve already learned, and the less money you’ll have to pay! Throughout your career as a student pilot, you will have countless resources at your fingertips to help you master whatever it is you’re currently studying for. Take advantage of them! All ERAU computers have the entire Gleim FAA Test Prep software to help you study for your FAA Knowledge Test. Over at the flight line, there are 3 Cessna 172 CPTs (Cockpit Procedure Trainers) to help you master those checklists, and multiple simulators that students can check out whenever they feel the need to get some practice without paying for the actual airplane. Not to mention your instructor will always be happy to answer any questions you might have! #5: Fly as Much as You Can! Make sure you keep your availability as open as possible so you can fly multiple times a week. The more frequent you fly, the better you’ll retain the skills you learn and the less you’ll have to repeat the lesson you’re on. Besides, who doesn’t want to fly several times a week? I was visiting a friend in Flagstaff, AZ this weekend at NAU (Northern Arizona University) (Flagstaff is an hour and a half north of Prescott) and we were working on homework Sunday night when all of a sudden we heard a loud BOOM! For a second we were both incredibly confused seeing that there wasn’t any chance of a Thunderstorm in the forecast for Northern Arizona and it wasn’t even raining outside in fact it was snowing! We ran to the door of the apartment to peak outside to see other NAU students anxiously looking out into the dark cold cloudy skies of Northern Arizona wondering if we weren’t all losing our minds. A few seconds later that’s when I realized what was actually taking place. I noticed off in the distance a series of lightning strikes flashing around the San Francisco Peaks followed by a mild rumble of steady thunder filling the silence of a quiet cold windy Sunday night — Thunder Snow!. I have a passion for weather. Being a pilot, it’s something I’ve learned to check periodically throughout my day so being able to witness the very rare phenomenon known as Thunder Snow had to probably be one of the most rewarding experience I have been able to witness while living here in Northern Arizona! The definition of Thunder Snow is an unusual kind of thunderstorm with snow falling as the primary precipitation instead of rain and occurs in regions where a strong upward motion is present within the cold sector of an extratropical cyclone (Wikipedia). This is one of the many reasons I adore the state of Arizona because you have a front row seat to some of the most amazing and most unique weather events that you may not have the luxury of experiencing in any other states in the United States. All you have to do is step outside and look up! To say this weekend in Palm Springs, California at the National Gay Pilots Association (NGPA) Conference was incredible would be an understatement. I can’t quite explain just how valuable it was to take a minute away from the study world to partake in an unforgettable weekend with my Riddle family. I am so passionate about the industry I am apart of and I love the people I have surrounded myself with over these last few years here at Embry-Riddle. I’m so grateful for the growth I’ve made since last year’s NGPA conference. This year’s conference brought along new experiences, new opportunities, new friendships, new sets of goals, and a completely different outlook on where I want my career to go in the future. I was able to solidify an internship opportunity with United Airlines and a possible job opportunity with PSA Airlines once I receive all of the required flight certifications. Yes, it’s that powerful! We even met and talked with Caitlyn Jenner who was at the conference and is a pilot herself. I believe the NGPA conference is an incredibly valuable conference for any aspiring pilot to attend because of all of the networking opportunities that are available with people from all parts of the industry. I’ve never been so happy just being me and I wouldn’t be where I’m at if it weren’t for what NGAP stands for and the community they have developed over the years as a safe zone for pilots all over the country. It is such an exciting and liberating feeling anticipating where my career will take me next. This is only the beginning the rest is still unwritten. My name is Jeffery Boudoin I’m from New Orleans, LA. I am a senior here at Embry-Riddle studying Aeronautical Science minoring in Global Business. My goal is to fly for British Airways flying multiple incredible routes all over Europe. I have been in love with aviation for as long as I could remember and decided to come to Embry-Riddle to pursue my dream of being a professional pilot, studying in a place where everyone shares the same passion as I do for flight. Top Secret ERAU Secret You Must Take Advantage Of! If you happen to be a Riddle student then there is about a 50/50 chance that you know something that many others don’t. Curious to know what I am talking about? 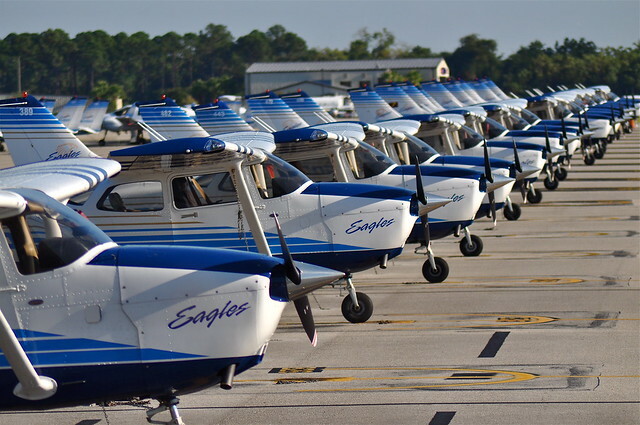 Embry-Riddle started as flight school in 1925 and the training great pilots continues to be a strong degree program. But, not only is ERAU a top flight school, it is a major contributor of graduates to the Engineering, Business, and the Global Security & Intelligence industries. Why is being a non-flight student at a University with a flight program COOL? I can almost guarantee that any non-flight student knows at least one pilot. And, any student that is a pilot knows that you can include one of your friends on a ride-along during an instruction. You may think, oh well that’s not a big deal, but it is! To share the experience of flying with your friends is awesome! Just last weekend I went on a ride along and took a couple pictures from the back seat. For someone who has only flown in the large 747 plane it was a hell of an experience. It was a great way to start off spring break and I would do it all over again in a heartbeat. The view in one of our practice areas. So if you are a student at ERAU then ask your flight friends about it, and if you are an incoming freshmen then be sure to make friends with a pilot! And don’t worry about safety, the instructors at Riddle are pretty incredible. So be sure to take advantage of this experience that most of your friends at state universities won’t ever have. Thanks for reading, stay tuned. Hi my name is Jessica Embrey. I am a freshman here at Embry-Riddle. I am majoring in Global Securities and Intelligence Studies. I have always been interested in this line of work. I think it would be cool to work as an analyst, in an embassy, doing field work, or in counter intelligence. My brother had just started at Embry-Riddle so I was learning more about the school and the different majors when one really caught my attention – Global Security and Intelligence Studies. GSIS, it was everything I wanted to do concentrated in a college major. Then I heard about spy camp. It was the perfect way to try out my interests so I signed up! My experience at spy camp was amazing. I met so many cool people that I am still friends with to this day. I also learned a lot more about what I wanted to do in my future. I experienced what it’s really like, not just what you see on TV (even though TV was a big part of how I decided I want this). The camp was very in formative and a lot of fun! We did so many cool activities like encryption and surveillance. It really helped to show me a different side of gathering intelligence. Attending Spy Camps is something that I recommend to everyone who wants to go into this field of work. No matter what summer camp you go to here at Embry-Riddle you will have fun and learn a lot of things. Whether it is an engineering camp, flight camp, or spy camp you will learn a lot and have a good time while also getting a look into a perspective career field and even getting a look at Embry-riddle to see if you want to come here one day! So take my advice, come to camp! Hello readers, if you aren’t currently an Embry-Riddle student then you might be wondering what the weather is like out here in Prescott, AZ. Well lucky for you I will be getting into how the weather is and how it changes mostly in respect to winter. This will be especially helpful for those coming from warm climates like myself. So ERAU in Prescott definitely gets FOUR seasons! Summer is hot, fall is bipolar, winter is cold and spring is a usually a good mix of warm and cold weather. But you must be wondering how cold it actually gets here… Well last week it reached 37 degrees (F) during the day! That’s crazy!…..I don’t want to scare you so ill lighten it up with some good news, such as this weeks weather. The average for the week turned out to be 56 degrees (F) midday, and 34 degrees at any given time after dark. So be prepared for the winter! while it is only this cold during the winter it does lighten up in the fall and spring, which are quite pleasant and beautiful. Being able to come out here and experience four seasons its great, there is really nothing like Prescott. For instance below is a photograph taken of Watson Lake after its snowed, which is right around the corner from ERAU. In fact most students that run, tend to run to the lake and back which takes about 30 minutes to get there, its a great trail! But enough about how cold it gets, the real question is, does it snow at Embry-Riddle and how often? Well for the past 3 years that I have gone to ERAU in Prescott it has snowed on average 10 to 15 days each year. And i would say about three of those days does it actually come down in a storm that makes it hard to drive. So if you drive you could get away without buying chains no problem but I have some anyway. The other thing to know about snow here is that is melts very fast rarely staying on the roads for more than half a day. As soon as the bright Arizona sun hits it, it’s gone. I hope you enjoyed this blog, stay tuned for more! Hello Everyone! My name is Mike Cruz, and I am excited to be posting my first blog! I am now a senior expecting to graduate in the spring with a Bachelors degree in Aeronautical Science and a Minor in Applied Meteorology. Furthermore, I am almost done with my flight training at Embry-Riddle, just finishing up the last bit of CFII (Certified Flight Instructor Instrument). If any of you have any questions please feel free to contact me and I will do my best to help you further understand what it is like to be a student and pilot here at Embry-Riddle. Here goes! You would think that by the time you become a senior registering for classes is a piece of cake. Well it is and it isn’t. In the beginning, as a freshman, you have this huge grocery list of classes you have to take, and really it is the pick of the litter as they say. However, now as I register for my final semester, each class is a calculated choice that fulfills the final requirements for my degree. Which excitingly are going to be, AS411 (Airline Transport Systems), AS420 (Flight Technique Analysis), and AS408 (Flight Safety). Furthermore in order to get the reduced ATP minimums and have credit for an ATP ground school to that the written exam, I am also taking FA420 (Airline Flight Crew Technique and Procedures). A mouthful I know, and they sound more complex than they really are. The classes listed above are basically very specific classes to help you understand the ins and outs of what it is like being an airline pilot! The process of registering for classes is really easy. Everything is done online, like shopping on Amazon. You have a “shopping cart” which is were you place the classes you would like to register for. Once in your cart and all you have to click is “enroll.” Very easy system! Timing is the another factor when registering for classes! You are in the middle of your current class load for the fall semester, — you’re focused, you’re determined, when all of a sudden BAM! You receive the email that it is time to register for spring classes next week. Being a college student really should be called “time management student.” Besides walking out of here with a degree you will become highly skilled in managing your time to the best of your ability. Which is an awesome accolade to have going out into the work force. With all that being said I have successfully registered for my final semester here at Embry-Riddle on time and very excited. Check out some of the classes I’ve taken and ones that you will take as an Aeronautical Science student here! Talk to you soon, and stay warm up in the north! Hello, I hope you have been enjoying the topics I choose to write about in my blog so for. 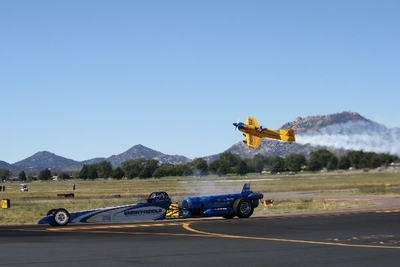 So, if you don’t already know last weekend at Embry-Riddle in Prescott, Az, we hosted what we call OctoberWest. OctoberWest can be explained in a few short words, Awesome, exciting, and a ton of fun! Octoberwest is full of a lot of different activities, so starting Friday. Small paratroopers are placed/hidden around campus and on each one is a card and with each card is a prize! some of the prizes this year consisted of a thousand dollar scholarship, video game system, laptop. Then in the evening at 4, the festivities begin with a handful of free item like tee shirts, glow sticks, coffee mugs, food! Among this are activities like the RC plane show, pugil sticks and a few other fun competitive activities. Oh I can’t forget the great fireworks show they held! But fortunately Friday evening doesn’t hold all of the fun, the next Saturday is the airshow! that’s right what could be better then having an airshow in your own backyard. its Amazing! On top of that this year they were offering B-52 rides! For all those that helped out with the events and for those that wanted to pay received a spot to ride. But I have to say one of the best things about Octoberwest is meeting new people and seeing friends. Its an event that not only brings the school together but the community. Although there is more, come check it out for yourself next year at Embry-Riddle. Thanks for reading. Hello there! My name is Maddie Roy, and I’m a native Prescottonian enjoying my junior year here at ERAU. I’m currently in the Global Security and Intelligence Studies (GSIS) program with a minor in Aviation Business Administration, and I’m also a helicopter flight student. didn’t really work out for me so I decided to come back to study GSIS at Embry-Riddle, which I love. Coming from an aviation family and going to an aviation school rubbed off on me and I decided I wanted to get my private pilot license for airplanes, which I did this summer. That got me inspired about aviation and I decided that I wanted to pursue a career in aviation, but this time while flying helicopters! So I started helicopter training this fall and I couldn’t be happier. You might be wondering how I am going to fit that all into one career. To tell you the truth, I have been wondering the same thing. But I figure, being young and having these opportunities afforded to me, there is no better time to follow your passion. When I’m not studying Chinese characters or memorizing emergency procedures, I like to take advantage of the abundance of activities that nature provides for us here in Prescott. I also work in the Admissions Department as a Tour Guide/Campus Ambassador, leading tours around our campus and flightline, and sometimes traveling to events with our admissions counselors. Having had a fairly unique college experience, I hope to be able to shed some light for those of you out there who are also coming to Embry-Riddle under a unique set of circumstances. Our bloggers share their stories about everyday life as Embry-Riddle students, and our Student Spotlights feature international students, internships, and studying abroad. We also love to talk about Eagles sports.